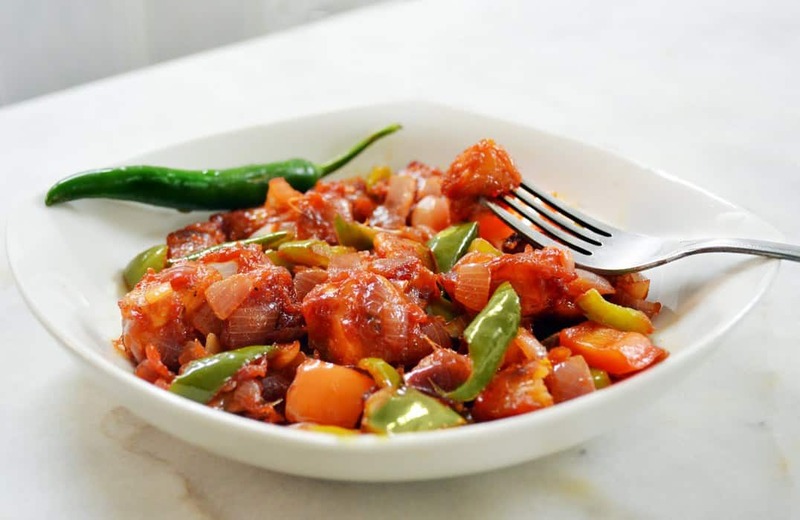 How to make chilli panner recipe at home: Paneer chilli recipe is one of the best delicious dish of Indo- Chinse cuisine. The making process of this dish is like chilli chicken recipe. Vegetarian people who do not eat chilli chicken, liked it very much. Not only vegetarian people but non-vegetarian people also like it so much. The special taste of chilli paneer recipe make it different from others recipe. Although this is a Chinse dish but all over the world it is very popular. There are many types of ‘chilli paneer’ recipe available like paneer chilli gravy type, dry types, white chilli paneer etc. But today I am telling about lite light gravy type chilli paneer dish. To make restaurant style “paneer chilli recipe” we use soya sauce, chilli sauce, tomato ketchup and some important spices. First off all take cube size paneer in a bowl. Add salt (as need), black pepper powder, ginger garlic paste and mix them well. After 10 minutes take 1 tsp all-purpose flour and add with paneer. Mix them well so that the flour stuck with paneer. Take all purpose flour (1 tbsp), corn flour or corn strach (2 tbsp) and water as required in a bowl. Mix them well to make like a paste. Take 250 ml (or as required) vegetable oil in a pan or kadai and heat it with medium or high flame. Dip paneer pieces into the flour-water mixture and then to the kadai for fry. Fry all paneer pieces one by one till golden brown. Remove paneer pieces on a tissue paper to remove extra oil. Take 2 tsp cooking oil in a pan or kadai and heat it. After enough heat the oil, add chopped ginger and garlic, onions, capsicum, red chilli powder and green sliced chilli. Shallow fry them for 2-3 minutes. Now add soya sauce, red chilli sauce, tomato ketchup, vinegar, salt, Ajinomoto, and 1/3rd cup water and mix them well for 2 mins. Add Paneer pieces, mix well. Finally, the hot and delicious paneer chilli recipe is ready to serve.